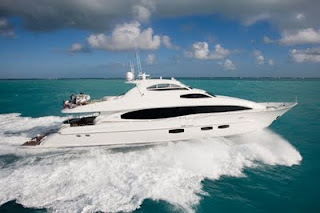 SERENITY is now offered for charter in Florida or the Bahamas. She features an open flybridge arrangement with an integrated hard top offering plenty of shade, tables for dining al fresco and a large Jacuzzi for plenty of relaxation. Her interior is comprised of a light pecan finish, comfortable modern furniture, and a beautiful wood floor throughout the salon. She accommodates up to ten guests in a five stateroom layout and has the option to convert one of her staterooms from a twin to queen arrangement. The open and inviting galley features a skylight allowing warm natural light to shine on the large settee. The other custom feature of this yacht is her chair lift that assists guests with difficulties in getting from the main salon deck to the stateroom level. All of these assets, combined with a friendly, outgoing and adventurous charter crew, make SERENITY the perfect choice for your next yachting holiday. Master stateroom- Below and aft, king size bed, vanity area, desk,large closet, full entertainment system, large flat screen TV, modern bathroom featuring double sinks and a large shower. VIP Stateroom - forward of the galley and below, queen sized bed, full entertainment system, large bathroom with shower, full closet. Port & Starboard staterooms- These two staterooms are adjacent and mid ship. The starboard room features a queen size bed, full bathroom with shower and full entertainment system. The port stateroom features a full size bed, full bath with shower, closet and full entertainment system. The divider wall between these two rooms can be opened to make one large suite with his and hers heads, or to have an open type nanny and children room. The Twin Stateroom can be converted into a queen bed and has a full bath with shower, closet and full entertainment system. This room also has 2 pullman berths which are suitable for children.